This piece of short historical fiction is based on events recorded in the diary of William McCarter. He was a Federal soldier in the famed, Irish Brigade. By telling the story of a young girl who was killed when Charleston, Virginia was shelled, his story illustrates the sad effects of the North’s war on the civilian population of the South. For more examples read War Crimes Against Southern Civilians by Walter Brian Cisco and published by Pelican Publishing. 1. History of West Virginia – West Virginia was founded by Abraham Lincoln’s presidential decree, June 1863. As this story takes place in October of 1862, Charleston was still part of Virginia, though the opening says (to facilitate modern understanding of geography) the setting is in Charleston, West Virginia. The following site has a good summary of the history. http://www.wvtourism.com/spec.aspx?pgID=149 and one can find a summary of West Virginia’s role in the Civil War. 2. The Suffering of the Innocent in Times of War. This flag is one of five regimental designs carried into battle by the New York State Volunteer Regiments. The motto written in old Irish tongue means: “Who never retreated from the clash of spears” The motto is thought to have been suggested by the Irish scholar John O’Mahoney. 9. Have students play a game of checkers. 1. transcribe – to listen and record in writing. 2. poncho – in these days rubber coated canvas with a hole that the soldier slipped his head through. 4. dilemma – A situation that requires a choice between options that are or seem equally unfavorable or mutually exclusive. 5. hamlet – a small village. 6. memento mori – a reminder of death. 116th Pennsylvania Infantry. Ed.Kevin O’Brien. Cambridge, MA: De Capo, 1996. There were tears soaked locks of here hair. And no child should ever die from such a wound. I just finished reading My Soul to Keep (Multnomah Books) by Melanie Wells. I first met Melanie in January 2008 at Kathy Patrick’s Girlfriend Weekend in Jefferson, Texas. A fiddle player, she accompanied guitarist and singer Trish Murphy, and I was quite impressed with Melanie. After reading her novel, My Soul to Keep, I am even more impressed. This beautiful and quiet-spoken author is deep water. She is a counselor in private practice in Dallas and is also the author of When the Day of Evil Comes and The Soul Hunter, two novels I now intend to read. For anyone who knows and loves to read about Dallas, Wells’ novel is a fine read. I was raised in Dallas, in parts of the city described in the novel, and as I read, forgotten streets and locations were resurrected in my memory. Wells is a skilled mystery writer, but she also has extraordinary talents in character development. Some children are key to her story, and though it’s tough to make a child’s character interesting and dynamic in an adult novel, Wells pulls it off. I’ve been an English instructor with universities for many years, and I identified completely with Dylan Foster, SMU professor and the novel’s protagonist. Why? In my fourteen years of adjunct English instruction at three colleges, I have known instructors just like Dylan Foster–sensitive, somewhat eccentric, and passionate. Wells’ story reveals deep research on her part in psychological and paranormal topics. The novel’s plot is solid, intriguing, and best of all–not predictable. While the novel has an edge to it, there’s nothing repulsive or offensive in its presentation. Wells’ novel reveals in-depth research on her part into the criminal mind, as well tremendous general insights into human nature. The novel is written so that the pace and intensity increases as you read, and before too many pages, you find yourself solidly, though imaginatively, a part of Dr. Foster’s world. “God has a tendency to not follow my orders, a niggling little policy of His I find quite maddening” (52). “The manic laughter drained from his expression, leaving the raw hate and the impentetrable mistrust from years of a hard, bottom-scraping life” (291). “My sink is pristine. My soul could use a can of Comet” (150). 1) Discuss who would be manhunters today? (Bounty hunters, criminal investigators, elite soldiers, etc.) What skills are required? How would Chicoilithe have learned his skills? Do you think he enjoyed hunting men? Why? What did Hemingway know of hunting and especially, of hunting men? 2) Chicolithe is a true character. How does knowing this affect your perspective of him? 3) Camp Ford and the lives of the prisoners held there is described in detail at this site: Research and share interesting findings. 5) Discuss the dog Nimrod? Why was he given this name? How is the term Nimrod used today? (Someone foolish or silly) Discuss its original use in the Bible. Tradition says Nimrod was the builder of the Tower of Babel. There are many other legends about the historical Nimrod. 6) Chicolithe’s “Let loose the dogs of war” is a quotation from Shakespeare’s Julius Caesar. Discuss its original context and why Chicolithe uses this quote. 7) Kate Stone from Brokenburn Plantation wrote a famous memoir entitled, Brokenburn. Research Kate Stone and the value of her journal. Find this book, read it, and discuss the life of a young girl in the time of war. Discuss why her family moved to Tyler. 8. Another of Chicolithe’s dogs was named Cerberus. In mythology, In Greek mythology, Cerberus was a vicious three-headed dog guarding the entrance to Hades, the realm of the dead. 9) Another allusion is to Cortez, the Aztecs, and the dogs Cortez used. Research how the conquistadors used the Mastiff in war. 1) Molly Moore – a famous poet and writer of the day and in years after the war. She was known as the Texas Songbird. There is a United Daughters of the Confederacy Camp named after her. She really did visit Camp Ford. 2) kepi – type of cap worn by some soldiers. 3) stockade – a fence of built around the prisoners. Camp Ford used pine logs. 4) Jayhawkers – rogue groups of men who terrorized the civilian (and sometimes military) population. Members were often deserters, criminals, escaped slaves, or fugitives from justice. 7) cypress brake – A brake is an area overgrown with dense brushwood, briers, and undergrowth; a thicket. As cypress trees must have water for at least some of the year, this was then a dense thicket of cypress trees. 10. lariats – Used for throwing. In those days in Texas, they were usually made of horsehair or leather. With this post, I continue work on my study guide for my collection of historical short fiction, Stories of the Confederate South. Summary of Story: After Jefferson Davis was captured, arrested, and taken to prison at the end of the war, Jim Limber was taken from the Davis family by force. The child was never seen or heard from again. When Davis was released two years later, he searched for news of Jim,’s welfare, but other than rumors, he never discovered anything. Remember too that Jefferson Davis was the most powerful and well-known man of the South. He knew everyone important in the South and many who were important in the North. When any child is taken from a family by force and nothing is heard for years, we tend to assume the worst. This story assumes the worst, and certainly Jim Limber would not have been the first child of the South—whether black or white—to die at the hands of the Northern invaders. Both Jefferson and Varina died without knowing what happened to Jim Limber. Those who took Jim away from the Davis family died with the secret. His disappearance remains one of the great mysteries of history. 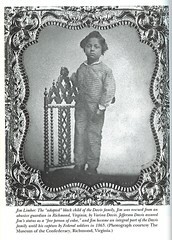 This story is speculative historical fiction, told from the point of view of one of the soldiers involved in “The Taking of Jim Limber.” It would be helpful for the student or class to also read, Jim Limber Davis: A Black Orphan in the Confederate White House. In addition, it would be helpful for students to use a good data base to find images of many items mentioned in this story. “My fault is past. But, O, what form of prayer Can serve my turn? ‘Forgive me my foul murder’? This epigraph is from Shakespeare’s Hamlet. Discuss the original context of the quotation, the tone it sets, and the direction it pushes the story. Discuss the meaning of this quotation in the context of the story. Encourage students to find their favorite Latin quotation. 1. laudanum – liquid, alcoholic, herbal, opium-based medicine. 5. rag parchment – paper made from cotton. 6. secessionist – Synonym for a Southerner, one who believed the Southern states had the Constitutional right to leave the Union. 7. tampion – a plug for the end of the muzzle loading rifles used in the Civil War. 8. slouch hat – a wide-brimmed felt hat. 9. tableau – a frozen moment on stage. 10. the devil’s tattoo – a drumbeat calling soldiers to formation or battle. 12. phantasm – Literally, an image of the fancy or imagination. Suggests a ghost-like appearance. 13. whirli-jig – Also spelled “whirligig.” A child’s toy that made a whirling noise. 15. shadenfreude – joy in the suffering of others. 16. canister – encased shot for artillery. Canister made a cannon a giant shotgun. 18. Uncle Tom’s Cabin – Anti-slavery novel by Harriet Beecher Stowe. 19. “quicklime white beam of the followspot” – 19th century version of a spotlight. 20. abolitionists – Abolitionists wanted to abolish slavery. However, some abolitionists were prejudiced, and though they wanted to end slavery, they did not want people of color in America at all. 1. Prejudice existed in the North as well as in the South during the Civil War. 2. In war, the innocent and the children often suffer. 3. Jim Limber was the first black American to be a member of a presidential family. 4. The power and pain of a guilty conscience. Setting: New Orleans after it’s been captured and occupied by Federal forces. 1. Research the 6th Louisiana. They were known as the Fighting Tigers. 2. Frederick was from Jack County, Texas and was a Federal soldier. Two thousand Texan men fought with the Union Army during the War Between the States. Some parts of Texas were against secession. 3. Research burial customs in Louisiana There is an indirect reference showing why New Orleans (and much of South Louisiana) uses above ground crypts and tombs. 4. Research General Order 28 and discuss how it affected New Orleans and how the citizens responded to it. 5. Frederick had spent time in Camp Ford in Tyler, Texas. Research this prison camp and create an illustrated map or model of the camp. The site of the camp is located just off Highway 271 outside of Tyler Texas. 6. Research Benjamin Franklin Butler, known as “The Beast.” Discuss why he was so despised. 1. Tafia – a low grade rum made of sugar cane. Opening Epigraph by Oscar Wilde: This epigraph is from Wilde’s poem, “Ballad of Reading Gaol” (pronounced “redding jail”). What tone does this epigraph set for the story and what truth does it teach us? Background of the Story: Since its beginning, West Monroe High School’s mascot has been Johnny Reb. They are a 5A school with high academic standards with a nationally known football team, The West Monroe Rebels. The school’s website is here: Several efforts have been made to force them to change their mascot and the use of the Confederate Battle Flag. These efforts have been resisted by school officials, students, and alumni. The Supreme Court refused to make the school change the mascot. For more similar society and school related issues, go this site and do some research: http://www.dixieoutfitters.com/heritage/news2.shtml. 1. avatar – an incarnation of a god in human form. 3) Gestapo – Hitler’s secret police before and during WWII. 4) Reconstruction – the period in the South after the war ended. 1). Using this story as a starting point, discuss how the war in the Middle East affects American families. 2) Joseph has the words to “I’m a Good Ole Rebel” on a tee shirt. Research the origin of the song, the movies the song has been in, and the tone and meaning of the lyrics. 3) Research the treatment of Confederate prisoners in northern prisons, (POW), and identify the philosophy of Federal treatment of prisoners. There are many Internet sites related to Civil War prisons and the History Channel produced one of Camp Douglas called 80 Acres of Hell. How does Joseph’s new knowledge of the soldiers’ lives in Rock Island Prison affect him? How do his new insights relate to the theme(s) of the story? 4) Joseph and his father were members of the Sons of Confederate Veterans. (SCV). Research and report on the Sons of Confederate Veterans organization. Be sure and communicate basic facts about them: Membership requirements, purpose and work of the organization, their work with cemeteries and memorials, historical work, and prominent writers. 5) Write or discuss the symbols scattered through the story and how the story addresses the stereotypical thinking of people. 6) Create a detailed and accurate model of Rock Island Prison. 7) This story is set in modern America. What does the story’s conflict reveal about the issues, then and now? I felt the need to create a study guide to help the many teachers purchasing Stories of the Confederate South. So for my blog entries, I’m going to try to enter one a day–one for each story in the book. Today is devoted to the collection’s opening epigraph and to “Deo Vindici,” a poem. 1) Discuss or research Walt Whitman, America’s Bard of Democracy, author of Leaves of Grass. He wrote several Civil War poems himself. Whitman was a nurse in the Federal Army. 3. Discuss or freewrite about the meaning of this quotation. Why would he say such a thing? Was America ready for the truth about the war then? Is it ready now? What if historical research reveals that we’ve been taught some things incorrectly? This is a performance poem, designed to be read aloud, and to be read with fire and feeling. A study could be made of oratory or of famous orators during the Civil War. 2) Vocabulary: A quiz may be constructed from these words. The students should definitely know the meanings of the words before they read the poem. As some variant spellings are used in the poem, this too can be discussed. Many of these words lend themselves to discussion and historical and cultural discovery. Each of these terms can be developed further in projects. 1. Deo Vindici – Latin for “God will vindicate us.” This was the official motto of the Confederacy. 2. neocon – an abbreviation for neoconservatives, the new conservatives. 3. Leonard Skynard – A famous Southern Rock Band. 4. Chivalry – A code of conduct for medieval knights that emphasized qualities such as oyalty to God, king, country, and friends; respect for ladies; courage in battle; truth and honesty in life; and protecting and helping the weak, helpless, innocent, and poor. 6. 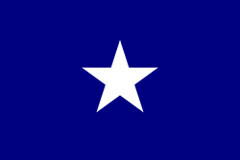 Bonny Blue – Usually spelled, “Bonnie Blue.” It was a very popular flag of the Confederacy, and a very popular song was written about it, “The Bonnie Blue Flag.” Here is an image of the Bonnie Blue. 7. Sharecropper – a farmer who earns a portion of the crops he works or pays the landlord a share of the crops he raises in lieu of rent. 8. Belles – A Southern lady. 9. Cajun – A descendent of the French speaking Acadians who were expelled from Canada by the British and settled in the Gulf Coast region, centered around Louisiana. 10. Creole – a descendent of the original French and Spanish colonists of Louisiana. 11. Tejanos – Texans of Mexican or Spanish descent. 12. Isleños – Spanish colonists from the Canary Islands who settled in Louisiana in the late 1700s. 13. Celts – A person of Irish, Scottish, Welsh descent. 14, Gullah – A member of a group of blacks inhabiting the sea islands and coastal districts of South Carolina, Georgia, and northeastern Florida. They do have their own dialect. 15. Geechi – Often spelled “geechee.” Also describes the people along Coastal South Carolina and Georgia. 1) Create a collage that represents this poem. 2) Research in detail one of the groups of people named in the poem. 3) Create a music CD of the different types of music and of the songs or artists mentioned. 1. To sharpen a knife: This is a skill he will need all his life, so the younger he learns this the better. Dull knives are more dangerous than sharp ones. 2. To fish or hunt: You know the saying–Give a man a fish and you feed him for a meal. Teach him how to fish and you’ve fed him a lifetime. And I think all methods are important–rod and reel, cane pole, trot-line, nets, box traps. Fishing is great in the South. Same for hunting. 3. To type: This is really not hard to do. Teach him the correct finger positions and call out the letters, numbers, and symbols he should type. I personally think a manual typewriter is best for this. Work him up to forty words a minute, and he will always be able to find work. 4. Teach him how to play different sports and encourage him to join organizations (Scouts, etc. ): He may not stick with any of them. He may not even like them, but if he knows he can make an intelligent decision about it. Besides, sports are good for a boy in this couch-potato, television numbed age. I really believe there is a physical sport for every and any boy. The more he learns the better. Time and talent will reveal the one(s) he excels in. Look for scholarship trends and opportunities. 5. To read and use a map: Very practical. Teach him perspective of distance and awake curiosity of new places. (Internet can help you with these matters). You can use a topographical map to teach compass use and about terrain when hunting. 7. To tie knots. We will always need to know how to secure items and accomplish tasks with rope and string. 8. To take photographs: One doesn’t regret taking too many photographs as much as “not” taking them. 9. To keep a scrapbook, diary, or create collections. Collections often teach the boy as he’s making them. 10. To defend himself and others. There’s no reason a boy or those important to him or the innocent about him should be victims. He will thank his father later for such training. 11. To start and build a fire (several different ways), to learn to swim, and other survival skills. 12. To work and to make money from that work. A boy who doesn’t learn how to work won’t be worth spit. There are many other skills and needs I could have put on this list, some that relate more to the spiritual and social side of a boy, but perhaps these will get you thinking. This list may be reproduced and used freely as long as you give me and the Southern Missive blog credit. I’ve been thinking of ghosts a good deal lately. I think it started with my trip to Greenville, MS and staying up late that Friday night 7wapping ghost stories. I heard some doozies! Enough to make you believe. Also, while in Jefferson, TX last Friday, I went on a ghost tour. The walk through Jefferson lasted about two hours. Evidently Jefferson is the seventh most haunted city in Texas. There were about twenty people strolling along with the tour. Some were really into ghosts. A few were members of paranormal societies. Most of the ghosts discussed are rather peaceful spirits, but a couple of ghosts were malevolent. I was surprised to see how many people live in haunted houses. I guess they’ve made their peace with the ghosts who live there. I would be afraid that I would tick the ghost off in some way and they would flip out in some macabre manner and take it out on me. Here is a photo of the ghost tour guide, Jodi. She is quite knowledgeable of Jefferson’s history and ghosts. Louisiana, like Texas, has its share of ghosts. I am particularly interested in ghosts of the Civil War. That will be my next ghost search. Tomorrow, I’ll be at the Grapevine Public LIbrary, presenting my Scots-Irish program for about 100 kids. Should be a great day. Hopefully, I return with a pic or two and a good report on it. Thoughts on Father’s Day: What is a father? There was always love ….. I won’t see my father on this father’s day, but I will call him. How can I tell him how much I love him? How can I tell him how grateful I am for all he did for me? I can only try.